My horses have been barefoot for so many years that I sometimes forget that other people are still fond of horse shoes. Let’s face it the majority of horses wear metal and few riders question the practice that has been the norm for hundreds of years. It’s often when things go wrong that we look for an alternative. A horse whose feet are crumbling, who is lame or can’t keep a shoe on for more than a few days is given a chance to be barefoot. 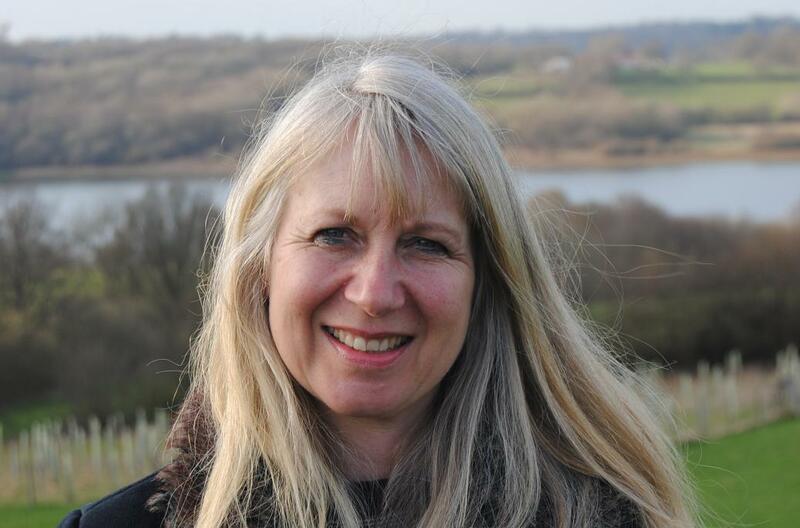 But that animal is going to have a difficult time of it – see my earlier post about Carrie’s ongoing battle to walk on her own feet – and, unless the owner and the professionals giving support have some experience of transitioning a horse to barefoot, the odds seem almost insurmountable. Horse shoes? Are they dangerous? 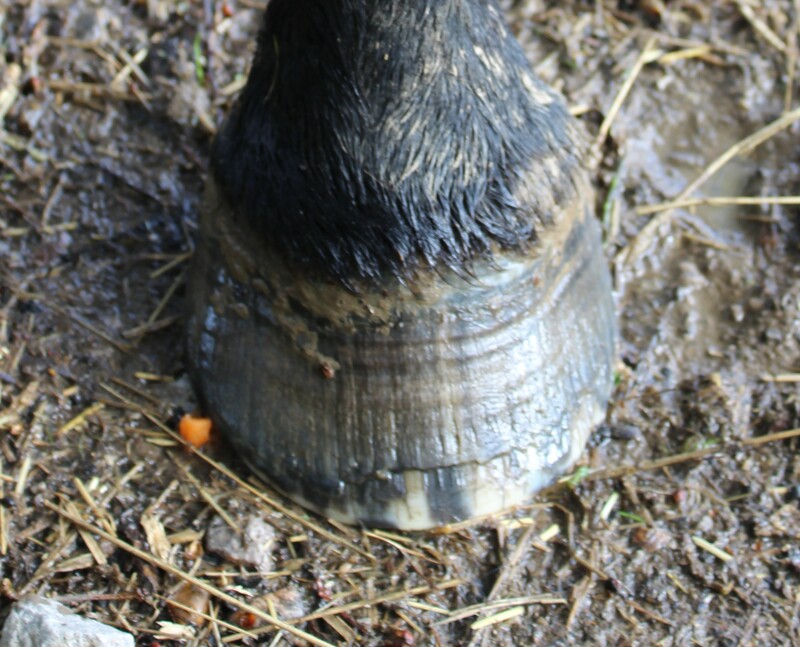 It would be wonderful if owners looked at their horse’s feet, saw that they were strong and concave and sound, and got rid of metal shoes because they were no longer needed. The horse with good feet has such an easier time. A few years ago, I needed a companion for my cob and took on an old pony who needed a semi retirement home. The farrier pulled Shanti’s shoes and he was ridden the same day without a stumble. He never looked back, never had an abscess or a moment’s discomfort whether he walked on roads or over stony tracks. There must be so many animals out there like Shanti who simply don’t need the things. But not many Shantis get the chance to show the horse world what they are capable of. The barefoot movement has made enormous inroads. I no longer get puzzled or disapproving looks from vets who visit the yard. They are used to barefoot horses because there are enough of them around but one day I hope vets will be supportive rather than tolerant. But how bad are these shoes? Plenty of horses reach old age wearing them and so riders can be forgiven for thinking they do no harm. Perhaps it’s similar to the old argument about the dangers of smoking. So many people didn’t believe smoking killed and would cite the case of an elderly aunt who puffed a hundred a day and got away with it. Surely no one today doubts that smoking is harmful but the issue of metal shoeing for horses is still up for discussion. It’s the easiest thing in the world to convince a non-horsey person of the dangers. I’ve tried it so many times and it goes something like this. Why don’t you like horse shoes, Linda? Well, the hoof is a flexible, moving part of the horse. It acts as a shock absorber and helps pump blood around the animal. If I have one of my horses handy and willing, I’ll pick up a hoof at this point and give it an illustrative squeeze making it possible to see what I’m talking about. Imagine the harm caused by nailing a metal band onto that foot. It can no longer flex on landing. It can no longer work. 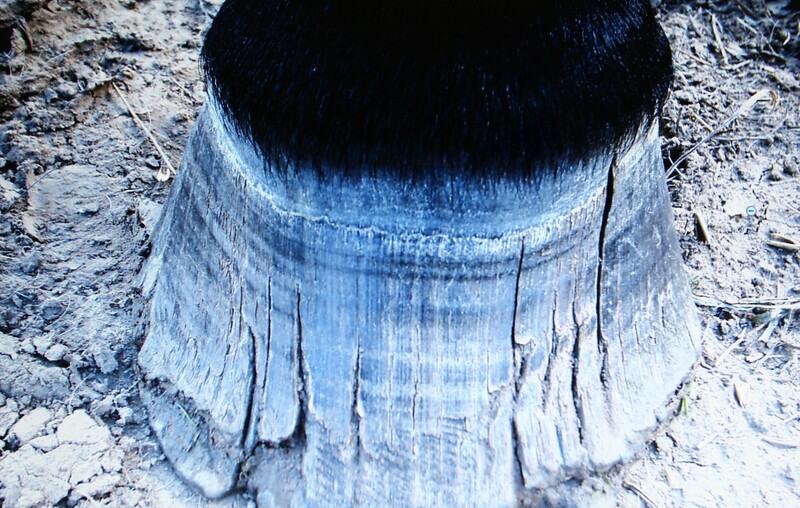 ‘It is also a truth that cannot be denied, that by shoeing the tender feet of the young and growing horse, which are then enlarging to their form with the other parts of the body, not only the evils arise that would occur to a full-grown foot if shod, but there is a partial arrestation of the growth attends it, with frequent disfiguration. His evidence is damning and yet the majority of horses still wear shoes and vets are hardly at the forefront of getting them removed for good. Only this week I heard the distressing story of an ex-racehorse whose owner tried him barefoot for a couple of years but was persuaded to return to shoes to prevent the horse slipping in the sand school. At first, she found it was wonderful not to worry about hoof boots or hard ground because the horse was never tender. The slipping was not improved by the shoes, however, but then something awful happened. One shoe came loose and moved to the side. The horse was lame. The farrier came and removed the shoe and suggested a poultice just in case. The next day the animal was in too much pain to move. The vet was called and found a nail had gone through the sole and had punctured the coffin bone. Emergency surgery was needed. The horse lived but I couldn’t help seeing an irony in the situation. Horse keepers take such care to keep fields safe from sharp objects. No one in their right mind would leave nails or broken glass where a horse might walk and yet thousands of nails are driven into hooves every day. It’s common practice but one day it might be regarded as cruelty. What do you think? This entry was tagged barefoot, Hiltrud Strasser, horse shoes, horses living naturally, Linda Chamberlain, natural horse care. Bookmark the permalink. Thanks for commenting. Press the “follow” button if you want to hear the next instalment ! I am in the process of taking off my horses shoes, and like to meander around the internet reading barefoot articles and “wonder stories”. I am totally flowing with this new movement, and very excited! Some articles though, are just plain out rude, bashing horse owners, even though they have never really given thought to this process. Your’s was refreshingly wonderful! loved how you worded it, and showed pictures of your horses hoof as well. I’m sure you have made a lot of people think about what is really happening under that piece of metal. 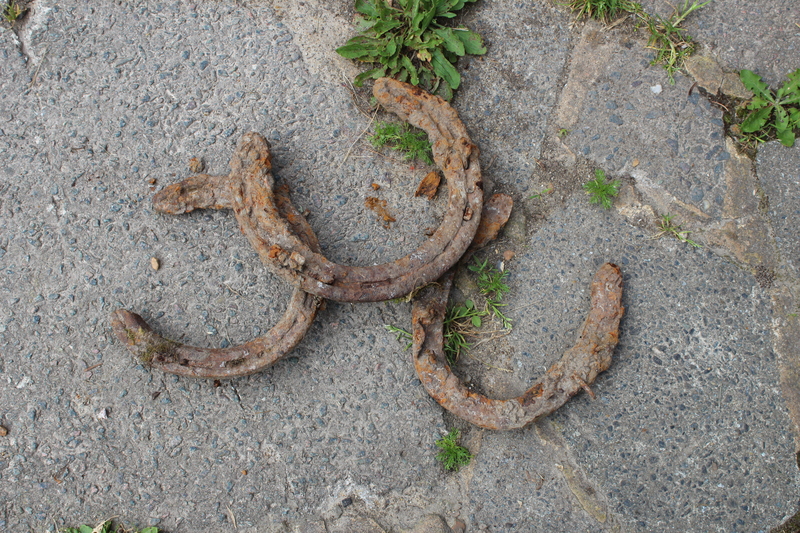 People are ignorant to what exactly metal shoes do to a horse (I certainly was!) . I have gone down the barefoot route as my horse was constantly loosing shoes and had poor hoof quality. What a difference it’s made! Yes, the horse needs time to adjust to the new sensations and you do need to have the patience to allow it time but in my horses case her feet and hooves are looking amazing! I use hoof boots on the fronts when riding but who knows, one day she may not even need those. Wonderful article! I would love to know the source of that devastating statistic if you’re able to share it! Ah, you are asking me about an article I wrote 4 years ago. I had to read it again and think I must have been quoting Dr Strasser from her book A Lifetime of Soundness.